THE Bear's Paw is unquestionably of frontier origin. Perhaps the pioneer father found such a track in his field or garden one morning and the mother bravely thought "how interesting" instead of "how dangerous." Then we suppose she transferred it to linsey-woolsey or hickory-dyed jean, using the unworn parts of much be-patched garments into a sturdy quilt! 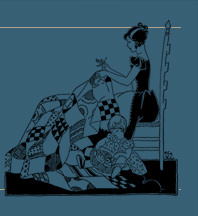 All of our series of old-time quilts have stories, more of them than we could possibly know of course. This very block, called "Bear's Paw" in certain localities is known as "Duck's Foot in the Mud"! That must have come later, or in more safely settled communities where the bears had moved on out even if paving had not come in. And the Friends down in Pennsylvania had the very same arrangement in a block called neither "Bear's Paw" or "Duck's Foot in the Mud" but "Hand of Friendship." From this by curving of the angles may have grown to another lovely block called "Hands All Around." A spider web stamped on the alternate plain squares from perforated pattern number 263 at 25 cents would exactly fit and be harmonious in design, as well as being a very easy pattern to quilt. This is a simple block to seam. Make each section the size of the given patterns when finished which means allow seams extra. 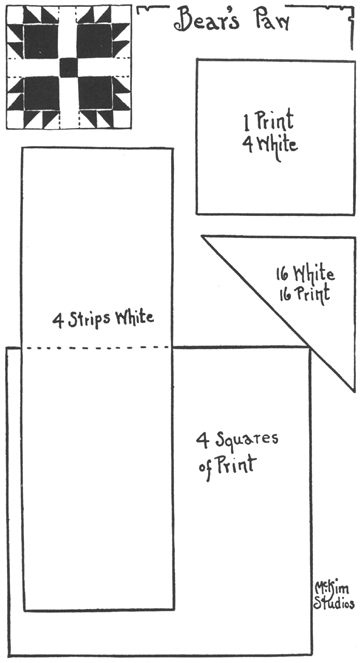 Material Estimate: Set together with alternate white blocks. These will be about 12 1/2 inches square, depending on the exact size of your pieced "Bear's Paws," 36 blocks, 18 pieced and 18 plain, plus a three-inch border at top and bottom will finish about 72 inches by 79 inches and require 5 yards of white and 3 yards of colored material.